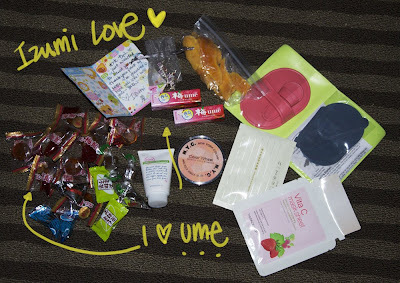 I got a love package from IZUMI~!!! she packed all this in a 4x6 box I was so shocked at all this stuff!! IZU-chan ARIGATOU NE!! you made my DAY!! also look at her beautiful jewelry she makes!! so gorgeous! she is my go to person for photography! ALSO I wanna thank to all the sweeties that have tagged and awarded me THANK YOU so so MUCH!! my CONTEST is ending this SUNDAY!! It worked? haha Iyah did a review on them.. u should check out that review! Aww Babes! Your contest! In all the drama with my laptop I almost forgot!! Dangit! Forgive me!! I don't think I can dress up, but I'll def try to do the MU part!! Izumi is soo sweet isn't she?! She's also the #1 Blog Pimp! LOL!! Her earrings look great on you! What a lovely package from Izumi! And the crystals in your necklace are so pretty, may I know what colours are those? i like ur necklace & earings! oh i would love to try that smooth away thing! my arms are really hairy ahahhrrrr. What's a smooth away?? I've never heard of it before O_O Normally I just leave my arms, unless I feel particularly hairy for some reason. oh, the smooth away is working,lol, i want it too. wink wink! oh your pictures are amazing, and your hair looks so pretty!!! yup! that smooth away thing is just for fine hairs. 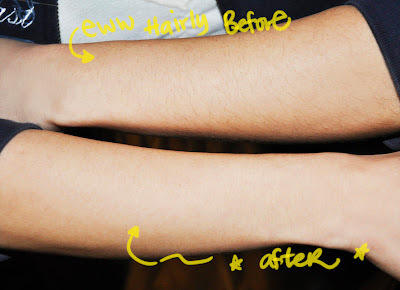 I tried it out at my friends house on my hairy arms too haha. pretty nice! I just never tried it on my legs and i dun think it'd work though cuz my hair is slightly more thick there. hey eki! what a nice package!!!! this blogger makeup community is lovely isnt it? Those earrings so pretty and they look very nice on you. What a great gift! it probably is just for fine hairs. i've heard girls say that it hurts. that's good that it worked on you! those earrings look beautifull on you!! and that dsk necklace is so kawaiiii!! i have seen the infomercial too and wonder if it worked. because it seems way to good to be true. But i've seen quite number of people tried and was impressed! haha, i am going to get myself one. i like that necklace :) so pretty! 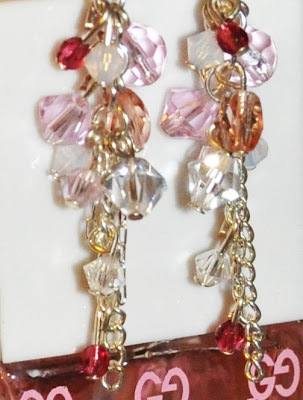 Pretty earrings. Are fresh Umes good? You look great as always on your photo. And about the cosmetic - it really worked! aww so sweet of her to send you a love pack!! You look gorgeous in her earrings! I wanna try that hair buffer thing now!! hehehe Izumi is super sweet!! i still have to post up our blog swap! i've been so MIA. i feel bad...and behind in the beauty blogging world! i was going to post up a review on that smooth away thing too! but i haven't yet, and lately, there are a lot of reviews about it popping up! haha xD sigh i have hairy arms too. =/ dad's genes! Eki dear~ lol omg you make me wanna try the smooth away!!! I have never seen it before! and i have smooth away too! :P I used it on my arms too haha! Your hair looks terrific in these pictures!! What a great lovepack! Your photos are so nice! Love and kisses to my Kawaii Darling!! your arms not not hairy! But the thing seems to do the job!